The small-town daydreaming just won't let up. Below are three things I really enjoyed reading this week. And surprise, surprise, they all are paeans to rural living. 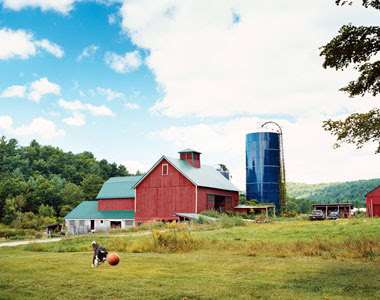 An exceptionally good article in this month's Conde Nast Traveler about the rustic charm of Northwestern Connecticut, worlds away and yet only a two-hour drive from NYC. Read about treehouse communities, raw milk aficionados and more. A friend sent me this blog about a Bay Area photographer who drove cross-country on her Vespa as part of a planned move to NYC. One slight hitch - she fell in love with a small town in Wyoming and decided to live there instead. This is the continuation of Vespa Vagabond. Wondering what a 31-year-old city slicker does after moving to a town of 300 people in Wyoming? Adopt an orphaned coyote and take amazing pictures of him, naturally.